A few words from our founder, Cheryl Bustin. We videoed Parker's most popular neighborhoods, capturing street scenes, homes, parks, golf courses, lakes, community centers, etc.. Many of our out of state clients have watched these videos before they arrive on their first house hunting trip. Often, they have already identified the neighborhoods that they want to live in. Watch this video of Idyllwilde. It is one of over 35 videos available for you to view and enjoy. See all homes currently for sale in each of Parker's best neighborhoods. With a video tour of each community. See a Real Estate Market Report of every Parker neighborhood. Report of all active listings, under contract listings and sold listings for last 6 months. See all homes currently for sale in Parker's neighboring towns. Ride with us as we drive and video downtown Parker Colorado. In this video, we simply drove all over Parker Colorado videoing places and events that we thought might be of interest to you. 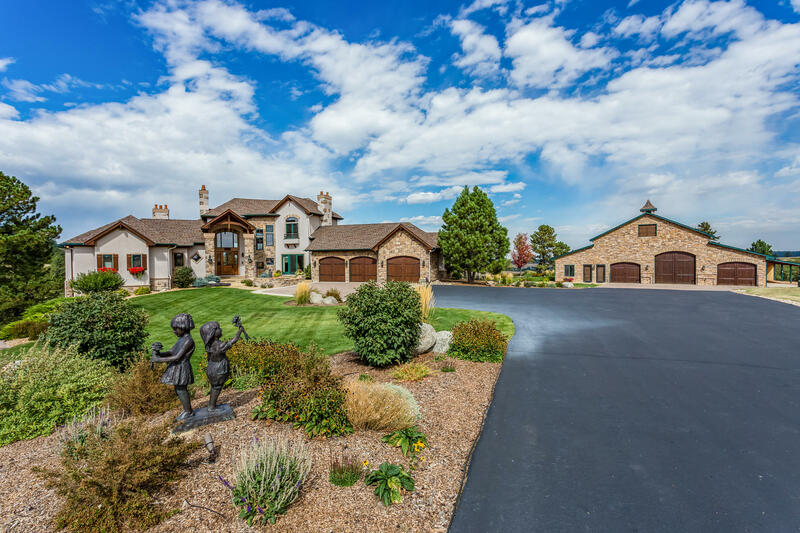 Click on this picture to view all photos, virtual tours and detail of this magnificent acreage estate located a bit south of downtown Parker, Colorado. Listed for sale at $2,650,000.